"My family loves this on a cool crisp fall day. I adjust the heat level by adjusting the hot sauce used. As submitted, it's safe for the little taste buds. I serve this with honey cornbread. Enjoy!" 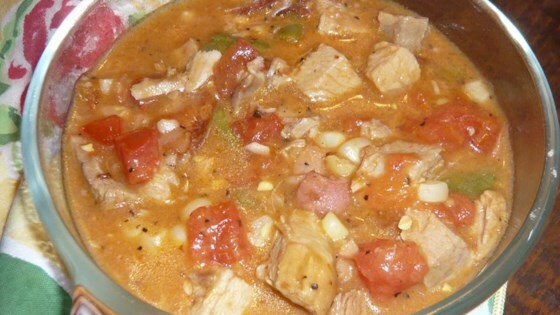 Combine cream-style corn, diced tomatoes, chicken, pork, sweet corn, ketchup, tomato sauce, water, bacon drippings, barbeque sauce, Worcestershire sauce, hot sauce, and black pepper together in a Dutch oven or stockpot; simmer over low heat until heated through, 20 to 45 minutes. Shredded beef can be used in place of shredded pork. I made this and it was delicious. I left out the chicken and added some celery.